Today's equipment is evolving at a rapid pace. Equipment sizes and speeds are growing beyond imagination. Demands on components have increased, and failure is not an option. 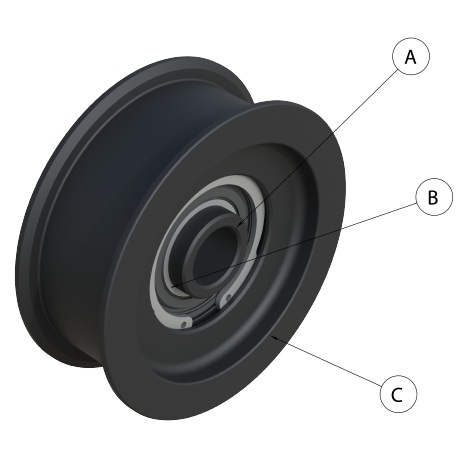 Black Ace Idler Wheel Rollers are designed to take the loads and strains of today's new drives. Production and dependability are key components to successful and profitable operations. Black Ace Idler Wheels will keep your equipment rolling. Precision machined steel. Bolt on with confidence. Limitless options of lengths and diameters means your application will mount to perfection. Say goodbye to washers. Larger than the industry standard. This means higher loads and longer bearing life. Multiple stacked bearings available for extreme loads. Superior seal construction. Contaminating environments greatly reduce bearing life; Black Ace seals protect the bearing's interior from the harsh environments to increase bearing life dramatically. Specially formulated grease. Lubrication is vital to bearings. This grease is designed for high loads and speeds to reduce wear. Precision machined. Concentricity and fit are completely controlled. Endless styles and profiles. If we haven't made it yet, we can. Multiple materials to choose from: Steel, Hardened Steel, Rubber-to-Steel Bonded, Cast Iron, and Urethane. Replaceable bearings – if your bearing does fail, it can easily be replaced.